I’ve collected my own video and audio from the two nights of protests, and am gathering some more footage from activists who were braver than I – people who got in the faces of the practitioners and one person who went to the site of one of the largest events and took footage of chickens lying half dead in the street and other carnage. I really can’t express here how horrific this was. Literally mass slaughter of animals taking place on public streets in the name of religion. I’m compiling this footage with original music and my own accounts of those nights to be a section of The Animal Show. It’s been difficult to bear down and get to work because, frankly, it was a very traumatic time. I got little sleep because I was going out at night looking for chickens who needed to be rescued after an evening of being mocked and threatened by throngs of people who were torturing these chickens in plain sight, as if we were the crazy ones for daring to suggest that what they were doing was animal abuse. This really blew my mind. The way he plays it favoring the knobs over the keys especially lit up my imagination. As a pianist, I really struggle sometimes to find new ways around the keys. I have my “go-to” melodies and hand positions that sometimes make me feel a little pinned-down to certain sounds. So the idea of using filters and oscillators to create the sound really feels like a kind of liberation to me. I realized Ron lives in NYC, so I shot him a message asking if he would be willing to give me a lesson on how he uses the MS-20 and I was thrilled to discover we live in the same neighborhood! He came over with his MS-20 and showed me a couple of things, and more importantly he talked to me about his philosophy on improvisation. So great. So so great. I feel like Ron has helped me unlock a new layer that I needed for my work. So that brings us to a sample I posted on my Drip page. This is a very beginning seed of an idea for sounds and rhythms that will underscore the Kaporos stories. Right at the :30 second mark, that distorted rhythmic pattern that comes in came from the MS-20. I recorded myself tweaking the synth in real time and then started chopping up some places that sounded good. This came from a rapid rhythmic pattern that emerged from the LFO modulating the VCOs, which (I think) I slowed down in Ableton and then ran through some effects to crunch it up. 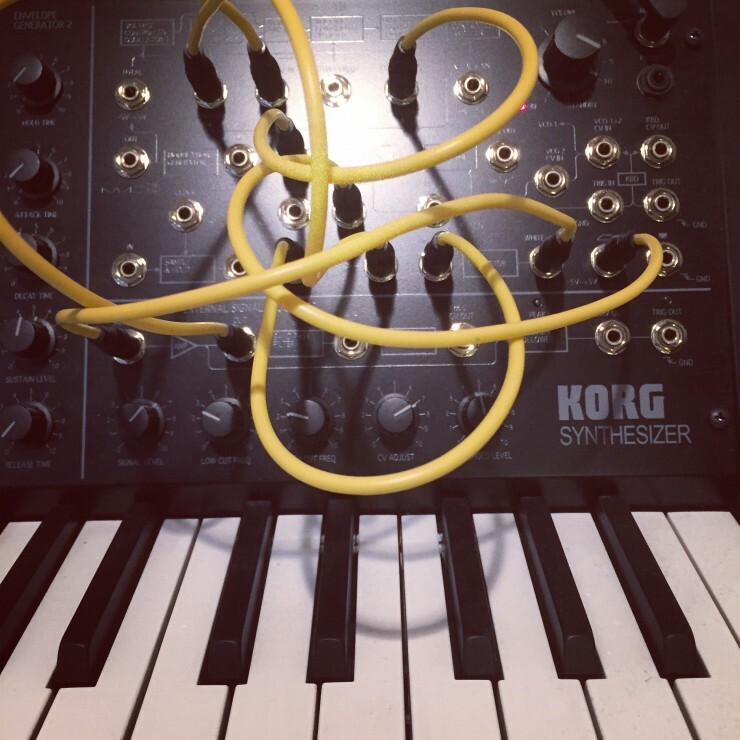 This kind of thing is really fun, and I love the way a melodic pattern emerged from a somewhat random practice on this synth that then dictated the harmonic structure of the other ideas. That particular sample (and tons of others) are only available to my Drip subscribers. It’s a really great place to stay connected with each other, and a great chance to throw me a few bucks a month to support my work. If you want to check it out, don’t hesitate to let me know so I can hook you up with a free month. So moving forward: this week I will dig deeper into the Kaporos stories and videos and see where it all takes me. Into the fire, as it were. I feel nervous about revisiting this stuff, especially all the video footage, but I really feel like this story needs to be told.